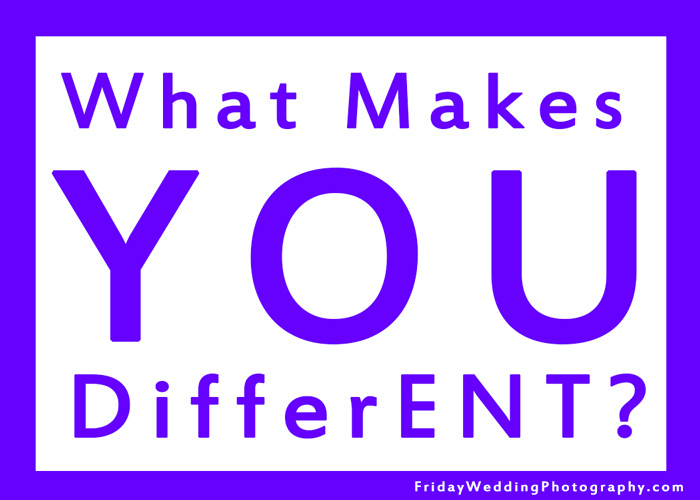 Friday Wedding Photography | Minneapolis Wedding PhotographerWhat makes YOU different? In addition to being a photographer, I am also a filmmaker. As such, it was through an educational webinar/webcast thing that I was introduced to Matt Davis of Life Stage Films. Throughout his presentation the thing that was 110% obvious was that this guy is totally genuine, he is filled with life, he is pursuing his dreams, and he is obviously unique. Luckily for me, and you, he is also committed to helping out other filmmakers on their quest to improve in their skills as well. One of the things he had on his educational website is this video. It was crazy powerful for me, probably because I have been really pondering what makes people unique and the importance in knowing and pursuing our uniqueness. So without further ado, here is the film! Distinct Vs. Extinct (What Makes YOU different?) from Life Stage Films on Vimeo. Aside from what makes you different in a professional sense like in the video, if we could only think about what makes us different as humans and what our purpose is and how that might differ from others around us – think of how much good we could do in the world!If we as filmmakers, photographers, musicians, artists, engineers, teachers, coaches, etc… could make it a goal to be the best at whatever our calling is, how much good would we actually be able to do! We weren’t created to be average but to be unique. Be different and make a difference. Be remarkable and be memorable. Stand out and stand up for being the change we want to see. This film showcases just that. Individuals who are taking that stand and identifying with what makes them different and in doing so, they are inspiring everyone we share this video with to do the same. Thanks for reading! If you’d like to connect or leave a comment, click here and fill out the connect form.